A Canadian mother has been reunited with her son who was abducted in 1987 as a toddler. Jermaine Allan Mann was allegedly taken by his father when he was 21 months old during a visitation in Toronto. He and his father lived under assumed names in the US until late last week, when his father was caught allegedly using falsified documents. The arrest brought an end to efforts by police in both countries to find the boy who went missing 31 years ago. Jermaine Allan Mann, now 33, had been told that his mother had died when he was a baby. Over the weekend, his mother Lyneth Mann-Lewis flew to the US for their reunification. On Monday, she described the seemingly endless hours between learning her son had been found and their first meeting. "Words couldn't express what I felt," she said. "The words 'Your son is alive, we found him' - that is breathtaking." She said the first thing she did before she even spoke to her son was to grab hold of him. "I wanted to see if he was real. I said 'Oh my God, my baby,'" she said. Allan Mann, 66, is alleged to have abducted his son on 24 June, 1987 during a scheduled visitation in Canada. He and Ms Mann-Lewis had separated the year before. 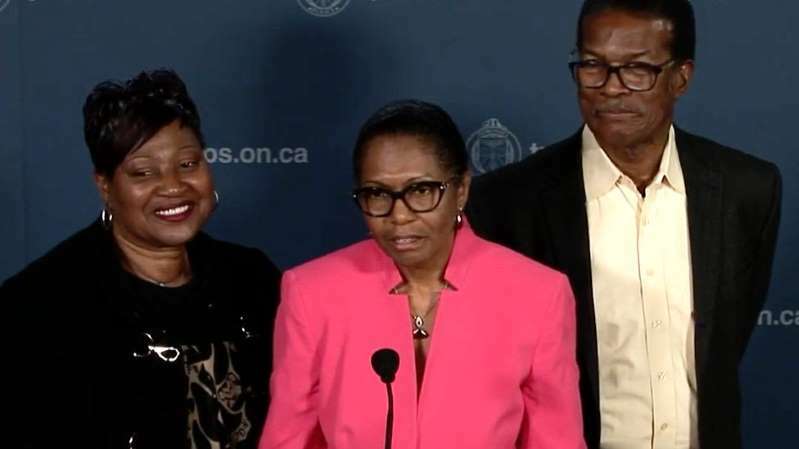 Toronto police launched an extensive investigation into the boy's disappearance, to no avail. The trail eventually went cold, though Jermaine's story and age-enhanced photographs were frequently circulated across missing children networks, and investigators on both sides of the border never gave up on the case. Most recently, it was raised between Canadian and US law enforcement officials in 2016, which renewed interest in the search. On 26 October, Mr Mann was arrested in Vernon, Connecticut, about 12 miles (20km) from Hartford, the state's capital. Mr Mann, a dual Canadian and Ghanaian citizen, is alleged to have obtained counterfeit birth certificates for himself and his son that claimed the pair were from Texas. The birth certificates were recently flagged as fake when Mr Mann used them as part of an application for a rental unit in federally subsidised housing. He was later identified using facial recognition software. He is facing charges of making false statements in the US. He also faces extradition to Canada on an abduction charge on completion of his prosecution south of the border. None of the allegations against Mr Mann have been tested in court. "I am the proof that after 31 long years of suffering one should never give up but be patient, be strong and believe that all things are possible and that anything can transpire," she said.